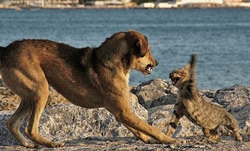 Reza Pahlevi: Why Cats and Dogs Always fight. Why Cats and Dogs Always fight. Hello again,now i'm going to retell you a story of why cats and dogs always fight.maybe you curious about that,right? Long, long ago, in northern Taiwan, there lived a farmer and his wife. They had a ring of gold. They did not know it was a lucky ring. Whoever owned it would have enough to eat. The farmer and his wife sold it to a jeweler. Soon afterwards, they grew poorer and poorer. They did not even have enough money to buy food. The couple had a dog and a cat. They also did not have any food to eat. The animals wanted to help their owners but they did know what to do. “I must sure that must have been a magic ring,” the dog said. After many days, they thought of a plan. Soon the cat caught a mouse. The dog followed behind while the cat carried it to the jeweller’s shop. The mouse crept into the shop and gnawed a hole in the box and brought out the ring. The cat put the ring in its mouth and ran home. The dog followed. Now the dog could only run on the ground. He had to go all the way around the houses and through the streets. But the cat was able to run over the house-tops. So the cat arrived home long before the dog. She brought the ring to the farmer and his wife. “This is a magic ring,” said the cat. “You must not part with it otherwise we shall be poor and have nothing to eat. I have brought it back. Please keep it carefully. You will find that we shall now be able to live comfortably again. Just then the dog ran in. the farmer and his wife beat him for not helping the cat bring home the ring. The cat sat on the lap of the farmer’s wife and purred. So the dog became very angry with the cat. Every time he saw her after that, he chased her and tried to bite her. This is why cats and dogs always fight.I think that is all that i can share about this story,Thank you.